Do you ever run across a business or a product and think, “Man, what a GREAT idea! Nice work to whoever thought of that!” For example, Chocolate Frosted Mini Wheats… I mean, genius, right!?! Probably a little better than my favorite chocolate cereal, Wittlebee can be added to my “So smart!” List. 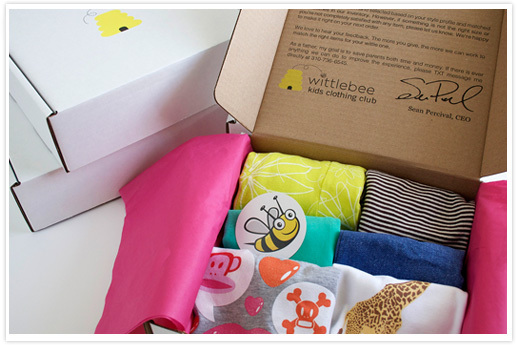 Wittlebee is an online clothing subscription for babies and kids, with a box arriving monthly full of the clothing necessities for your growing bundle of joy. You can choose what type of clothes you like, as well as the style that you most want to dress your child in… preppy, sporty, princess, etc. To me, it screams convenience, especially for moms who want to focus on other things rather than clothes shopping. How smart! You start off filling out a questionnaire, and then the rest is on auto-pilot. Kind of like a beer of the month club… only for clothing. Here’s the site… it would be a kind present for a new mommy, or just busy parents! True, a great idea. Maggie needs her own category though. She’s not the princess type, nor the diva, maybe the sporty, but the preppy? How about preppy/sporty and sometimes princess? Another idea: a mixed box. Love it! I just discovered this for plus size women’s clothing too – called Gwynnie Bee. I am doing a free trial right now.